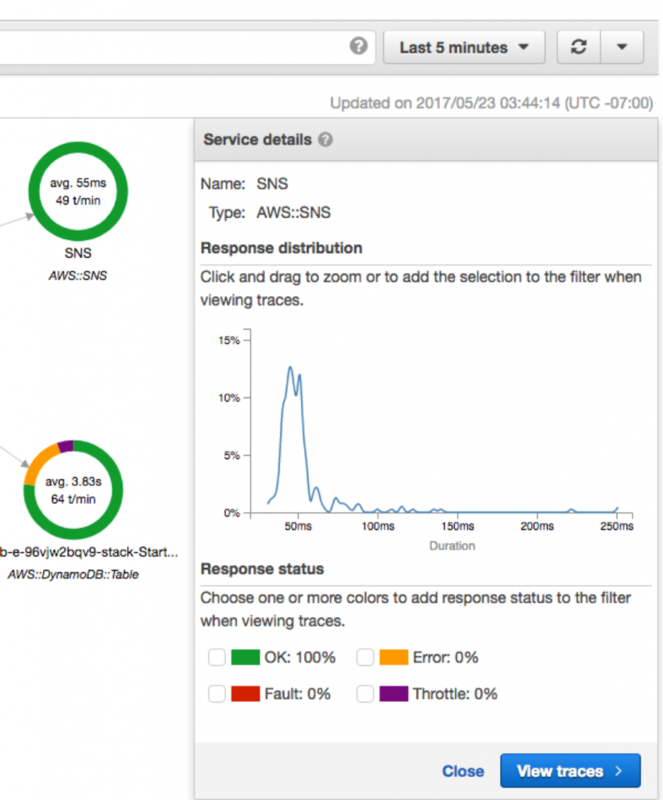 We’re continuing to iterate on the AWS X-Ray service based on customer feedback and today we’re excited to release a set of tools to help you quickly dive deep on latencies in your applications. Visual Node and Edge latency distribution graphs are shown in a handy new “Service Details” side bar in your X-Ray Service Map. The X-Ray service graph gives you a visual representation of services and their interactions over a period of time that you select. The nodes represent services and the edges between the nodes represent calls between the services. The nodes and edges each have a set of statistics associated with them. 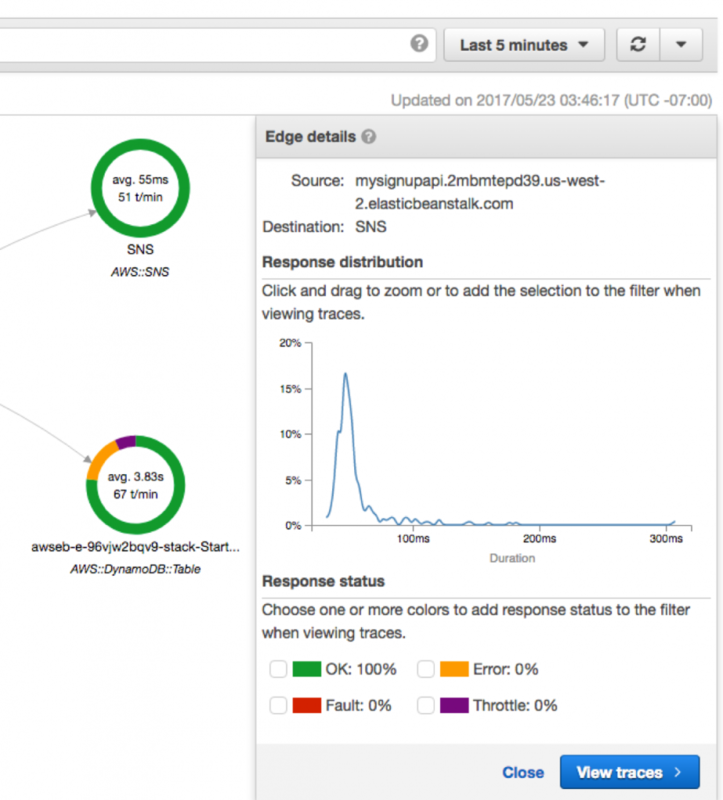 While the visualizations provided in the service map are useful for estimating the average latency in an application they don’t help you to dive deep on specific issues. Most of the time issues occur at statistical outliers. To alleviate this X-Ray computes histograms like the one above help you solve those 99th percentile bugs. To see a Response Distribution for a Node just click on it in the service graph. You can also click on the edges between the nodes to see the Response Distribution from the viewpoint of the calling service. The team had a few interesting problems to solve while building out this feature and I wanted to share a bit of that with you now! Given the large number of traces an app can produce it’s not a great idea (for your browser) to plot every single trace client side. Instead most plotting libraries, when dealing with many points, use approximations and bucketing to get a network and performance friendly histogram. If you’ve used monitoring software in the past you’ve probably seen as you zoom in on the data you get higher fidelity. The interesting thing about the latencies coming in from X-Ray is that they vary by several orders of magnitude. If the latencies were distributed between strictly 0s and 1s you could easily just create 10 buckets of 100 milliseconds. If your apps are anything like mine there’s a lot of interesting stuff happening in the outliers, so it’s beneficial to have more fidelity at 1% and 99% than it is at 50%. The problem with fixed bucket sizes is that they’re not necessarily giving you an accurate summary of data. So X-Ray, for now, uses dynamic bucket sizing based on the t-digests algorithm by Ted Dunning and Otmar Ertl. One of the distinct advantages of this algorithm over other approximation algorithms is its accuracy and precision at extremes (where most errors typically are). An additional advantage of X-Ray over other monitoring software is the ability to measure two perspectives of latency simultaneously. Developers almost always have some view into the server side latency from their application logs but with X-Ray you can examine latency from the view of each of the clients, services, and microservices that you’re interacting with. You can even dive deeper by adding additional restrictions and queries on your selection. You can identify the specific users and clients that are having issues at that 99th percentile. This info has already been available in API calls to GetServiceGraph as ResponseTimeHistogram but now we’re exposing it in the console as well to make it easier for customers to consume. For more information check out the documentation here.